Welcome to this week’s remarkably calm and silly Wolfcast review of The Breaker of Chains, in which Shellfish (Peter) decries the lack of krakens in Denmark; the Podcast Bard (Jed) advocates the use of Molestown condoms; Patrick The Tall baptises Middlefinger “Petyrphile”; Nadia flips all kinds of tables; Imogen.OB suspects the Nordic contingent’s knowledge of Molestown brothels; Regula Roone (Seif) wonders if we will see Satin and Bina007 wonders what FTWard’s problem is with potatoes. If you just want to get to the discussion of the notorious Jaime-Cersei crypt scene, it starts at 1h17m. The unusually long and gag-free aftershow begins at 1h41m. It is surprisingly earnest and covers everything from Westerosi religion to the importance of direwolves to the Stark children to the nature of Bloodraven and more besides. 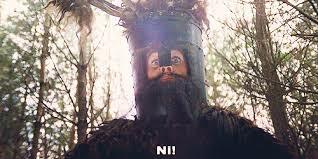 Edited by Bina007 lovingly using images and sounds from the glorious Monty Python and the Holy Grail. This entry was posted in A Song of Ice and Fire, Game of Thrones, Podcast, TV Shows and tagged Bina007, Imogen.OB, jed o'white hart, Nadia, reg roone, Ser Patrick the Tall, Shellfish. Bookmark the permalink. Oh dear, didn’t realise you recorded the after show. But A+ editing Bina, made us sound somewhat coherent, despite shocking lack of knowledge. @FTWward – thank you kind, Ser! @Imogen.OB – I really enjoyed that part of the discussion – I just edited out the twenty minutes of Made in Chelsea chat! @Valkyrist – if it turns out you watch MIC your reputation as the artsy elite will have been forever damaged! Great episode, you outdid yourselves, guys. I’ve listened to the whole thing in one sitting. Joffrey’s 13th nameday tournament wasn’t held in Lannisport. It took place in Kings Landing in A Clash of Kings. No Valyrian Daggers were wagered. The Valyrian Dagger was wagered in Joffrey’s 12th Nameday tournament also in Kings Landing. It took place before the start of A Game of Thrones. Jon Arryn died two weeks later and during that time Cersei and the children were on their way to Casterly Rock to meet Tywin Lannister for the first time in a number of years. Littlefinger lost the dagger to Robert. Sansa can’t inherit the Vale of Arryn. She is not an Arryn although Harrold “the Heir” Hardyng is on his grandmothers side. Her name was Alys Arryn and she was married to Elys Waynwood. Sansa can on the other hand inherit Riverrun if Edmure and his son/daughter dies and the oldest surviving Stark brother inherit Winterfell, in this case Rickon, because Bran is now a tree. Maggy the frog is the grandmother of Sybell Spicer, the mother to Jayne Westerling. She is from Essos. And what about House Haigh coming to Stannis side, according to Davos? They are banner men to House Frey!? Really? I don’t think so. What the hell are David and Dan doing?!?!?!?! And ditto about King Orys! I really love your reviews. Please don’t stop. @A Song of Ice and Fine Fan – so embarrassing, I always mix up Maggy and the ghost of high heart. thanks for keeping us on our toes.